Champions Zurrieq ended the season unbeaten after turning defeat into victory to beat Msida St. Joseph 2-1 at the Centenary Stadium as the last six matches from the BOV Third Division were played on Saturday. Mohammed Telessi put Msida ahead on the 20th but Dylan Darmanin equalised on the 47th and Ryan Farrugia made it 2-1 eleven minutes from time. 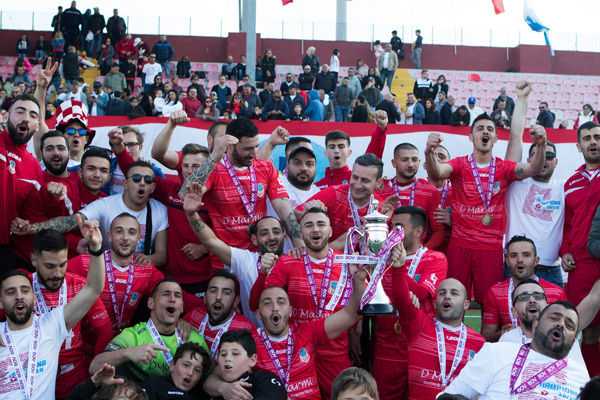 After the game, MFA Vice President Ludovico Micallef and BOV Executive Geoffrey Ghigo presented the BOV Football Third Division Trophy to the champions. Kirkop United beat runners-up Xghajra Tornados 1-0 at the Luxol Stadium thanks to a goal by Ayrton Buhagiar on the 7th minute. Attard defeated Marsaskala 4-2 at the Sirens Stadium. An own goal on the 25th minute put Marsaskala ahead but Bledi Alla equalised on the 70th and two minutes later, Nigel Spiteri made it 2-1. Jamie Delia scored a third goal on the 87th and although one minute in added time, Elton Caruana reduced the gap for Marsaskala, Bledi Alla made it 4-2. A goal by Clint Vassallo on the 36th handed Ghaxaq a narrow win over Dingli Swallows at the Centenary Stadium. At the Sirens Stadium, Mdina Knights beat Mtarfa 5-2. Daniel Joseph Sant opened the score for Mdina on the 25th. Four minutes in the second half, Julien Iwueke doubled the score and Daniel Sant added another on the 57th. Ryan Sciberras extended the lead with two goals on the 67th and 78th. Ryan Debono and Gabriel Farrugia scored on the 87th and 88th to reduce the score for Mtarfa. In another match at the Luxol Stadium, Ta’ Xbiex defeated Gharghur 2-1. Nicholas Scicluna put Ta’ Xbiex ahead on the 13th minute, Malcolm Mamo doubled the score on the 52nd and Kieran Bugeja pulled one back for Gharghur on the 79th. Zurrieq end their commitments on top with 58, points, followed by Xghajra on 51, Msida on 46, Mdina and Attard 38, Dingli 36, Kirkop 32, Ghaxaq 29, Ta’ Xbiex 21, Gharghur 19, Marsaskala 6 and Mtarfa 2.